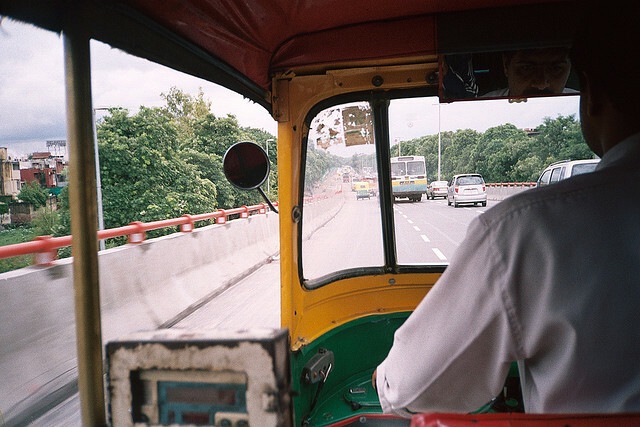 New technology to replace old meters could benefit both drivers and passengers of India's auto-rickshaws. Photo by McKay Savage. This blog post is a part of the catalyzing new mobility program and receives support from The Rockefeller Foundation. In a previous blog post, we highlighted the various opportunities in the auto-rickshaw sector for entrepreneurs to develop innovative businesses. One opportunity that is gaining momentum is the development of smart technology applications (“apps”) to enhance auto-rickshaw rides. Key features include real-time routing information and distance-based fares (based on government-regulated fares) to allow users to get an accurate account of their trip and fare details. What are some key examples? Another fare calculator app for iPhone and Android phones is A-Rix, which uses a phone’s GPS to map the total distance traveled and calculates the fare. The app is available for $0.99 and covers 15 cities, including Delhi, Mumbai, Hyderabad and Bengaluru, with a custom fare chart option. Suruk, an Android phone app, serves as a digital handheld meter and provides approximate fares for auto-rickshaw and taxi rides. It also allows people to learn about the driver’s past conduct through reviews from other users. AutoMeterFare India, another Android app, checks if the fare is valid and provides shortcuts to traffic and police helplines in the city. MumbaiAuto is another Android app that doesn’t require GPS or GPRS for fare calculation. For the last few months, MeterPodu, an online crowdsourcing tool for auto-rickshaw fares in a number of cities including Chennai, Hyderabad, Mysore, Coimbatore and Bengaluru, is being used extensively by auto-rickshaw users. The tool allows users to feed in information about auto-rickshaw fares from point A to point B, which can then be used by other users. The tool provides the route map, standard charge based on government-regulated fare, as well as typical fares charged by auto-rickshaw drivers on that stretch of road. The tool was well-received, getting nearly 1,500 hits on the first day. The developers have also developed a mobile version of it. Why are these apps important? Auto-rickshaw users in India often complain about over-charging and tampered meters. Verification of the accuracy of meter-fares often becomes difficult for passengers because of the lack of alternate sources of information. With an increasing number of smartphone users, such apps provide real-time and accurate information to verify the accuracy of fares. With the ability to do real-time tracking of routes, such apps are also useful for passengers to assess optimal routes to reach their destinations and avoid being taken on longer routes. These apps can be particularly useful tools for new visitors and tourists, who can avoid being overcharged for their auto-rickshaw or taxi trips. With real-time tracking and crowdsourcing options, these apps play an important role in enhancing passenger safety. Apart from the apps focused on auto-rickshaw users, specifically, there are several other useful apps for commuters, in general. See this list of free apps that help make people’s commutes a little bit easier in India. A dash of ‘desi’ apps!